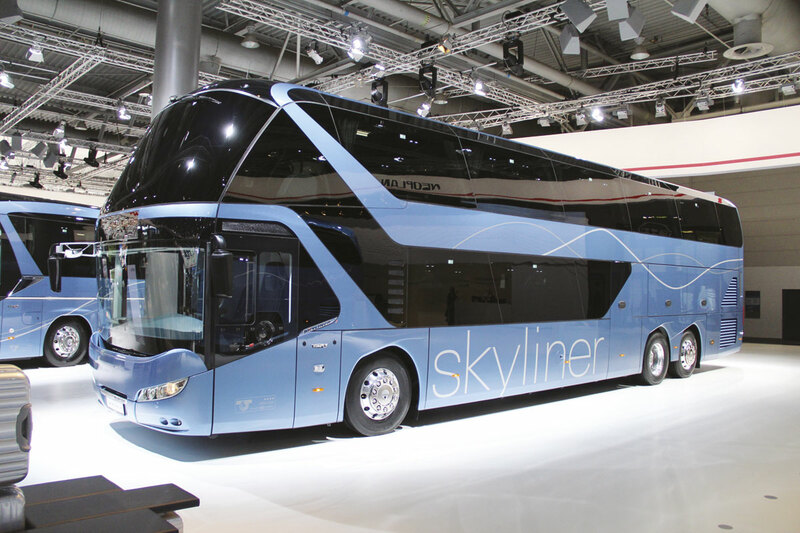 The double deck Skyliner coach is now to be built at the state of the art plant at Ankara. Anders Nielsen answers questions put by Stuart Jones. Born in Sundbyberg, Sweden on 18 December 1962, Anders Nielsen went to the Linkoping Institute of Technology where he studied industrial economy, joining Scania AB in 1987. In 1995 he took responsibility for managing gearbox production at Scania’s Sibbhult plant and two years later became manager of the Oskarshamn plant in Sweden. In 2002 he went to Brazil to become Technical Director of Scania Latin America, returning to Scandinavia four years later in 2006 as Senior Vice President of Scania with responsibility for chassis and cab production. A further four years saw him join the Scania AB Executive Board with the Production and Logistics portfolio. 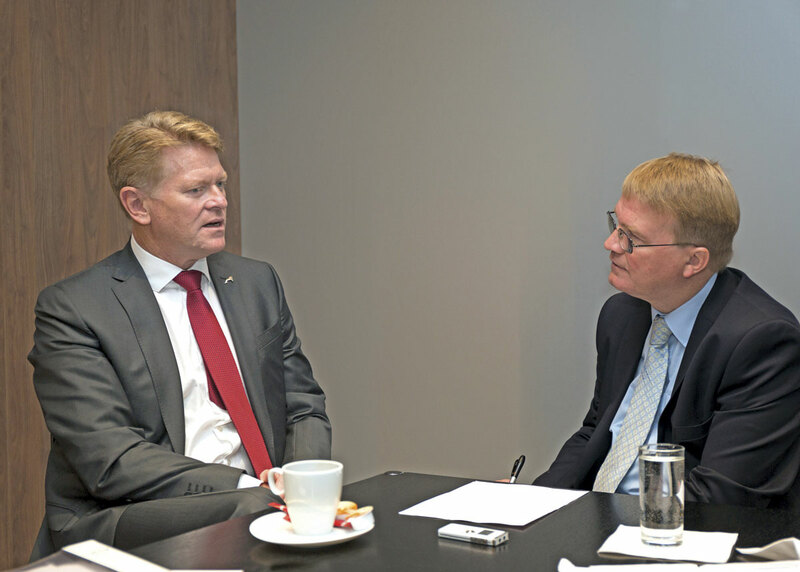 Elevation to his current position as Chief Executive Officer of MAN Truck & Bus AG, based in Munich, came on 1 September 2012. SJ. What do you see as the key advantages of having become part of the Volkswagen fold for MAN? AN. From a technological point of view, Volkswagen is an outstanding group in research, resources and technical competence; that is important for us. It gives us a cooperation umbrella under which I think we can develop faster and more precisely the right products for the customers. Of course, the commercial vehicle part we bring to the table and what we get from the Volkswagen Group I would say is the technological part and the resource you need today to really make sure you have state of the art vehicles. SJ. Is there a downside? AN. I think we have to acknowledge that there are commercial differences between cars and commercial vehicles. If you don’t acknowledge that and you try to plan around a commercial vehicle operation in the way as around a car business you would be struck by the volatility and also a lot of other issues. One thing it is extremely important for me to emphasise is the need of a strong network to service the customer. The new vehicle is just one part of the business. To really make sure that you support your customer with services to give him the up-time he needs and make sure that he can deliver the quality of his services that he needs. That is a bit different between cars and commercial vehicles. We can’t have a replacement car easily. If your car breaks down you can go to the closest retail outlet and say please fix my car and you’ll get another car, but that doesn’t really work with commercial vehicles. If they break down you have to fix them really fast. It’s a different approach in the service of the customer and that I would say is the biggest difference in the business model. SJ. VW recently bought Blackberry. Does this have any implications for the bus and coach industry? AN. I’m sorry, I can’t comment on that, you’ll have to ask Volkswagen. SJ. With Scania in common ownership, how can you work together in the interests of both marques and in which areas will there be total autonomy? AN. What we can achieve is common development of components and technologies that could serve the customers in a very good way. On the other hand we have to make sure that we keep the brands separated. For us, the MAN brand and its sales and service network is the face to the customer. That means we have to keep apart. We have to make sure that we have what is the best in dimensions for MAN and that we have to keep. We have to try and leverage on the technological and other cooperation and cost issues that we can find. SJ. When will we see a product that is a result of that joint working and what product might it be? AN. We have announced today that we will have a common gearbox programme. We have reached an agreement that we will jointly develop gearboxes for the future. We will also use the current Scania gearbox in our vehicles, of course with adaptation for our specific vehicles. All in all it’s a first start for long term cooperation. I am very confident to be able to say that we will be able to bring a benchmark in gearboxes to the market together. SJ. Why was the decision to stop supplying engines to other bus manufacturers taken, and how confident are you that the positive elements of the decision will outweigh the negative ones? AN. I would like to widen the scope of that question. If you compare the truck and bus markets, in the truck market you basically have six competitors in Europe and a market averaging roughly 300,000 over the years. The bus market is 25,000 vehicles divided by 16 competitors. That means that the real hard investment that you have to put in to have a good bus in the market is the research and development in the power train. If that does not work it doesn’t matter how beautiful you make your bodybuilding. If it is that we put a lot of resources into, and then we sell it to our competitors, then the step in is lower for them. They can just buy the powertrain and make a beautiful body to go with it. That for me is one of the problems that makes the bus market extremely complex at the moment. Without mentioning any brands, you have players stepping into the market, being active for a couple of years, and then falling off. That of course brings a lot of price issues to the market. How do you bring profitability to the complete bus market? With the same prerequisites that you have to deliver quality, you have to deliver sustainability to the customers and also a service network. So from our perspective, to deliver engines to players that will step into the market, be there for a couple of years and step out is not improving the bus market situation. We have a lot of customers for our engines who are not in direct competition with our own products and we prefer to use our capacities in that direction. Direct competition with ourselves I don’t see as a good solution to the problems. SJ. The decision to close the coach manufacturing plant at Plauen was very sudden, as evidenced by the fact that you were just about to commission a new multi-million euro paint plant when it was announced. Please can you explain the reasoning? AN. Perhaps from the outside you can say it was sudden but with the utilisation levels that we’ve been working with in the bus operations, from an internal point of view it was not at all sudden. It’s a decision taken after long, long discussions and long, long solution finding, but at the end of the day we have set up a structure whereby we can have a sustained utilisation level. I’m very sad that we had to do what we did in Plauen. I’m proud of how the people there have performed. It’s nothing against the people in Plauen or the performance of the plant in Plauen. It’s just a problem to run our bus volumes over four plants in the world. So we have had to consolidate this one and create our own economies of scale. Also from a quality perspective, if you have these really low volumes and you have the volatility of the market coming in, to make sure that you have the right quality levels you need a little bit bigger volumes. So for us it was not unexpected within the company, but of course a very hard step that was necessary to create a sustainable structure. SJ. So you’ll build the Skyliner in Ankara? AN. Yes. Our plant in Ankara is a fantastic plant, perhaps you have visited it. We have improved it over the years and I’m very proud of it. 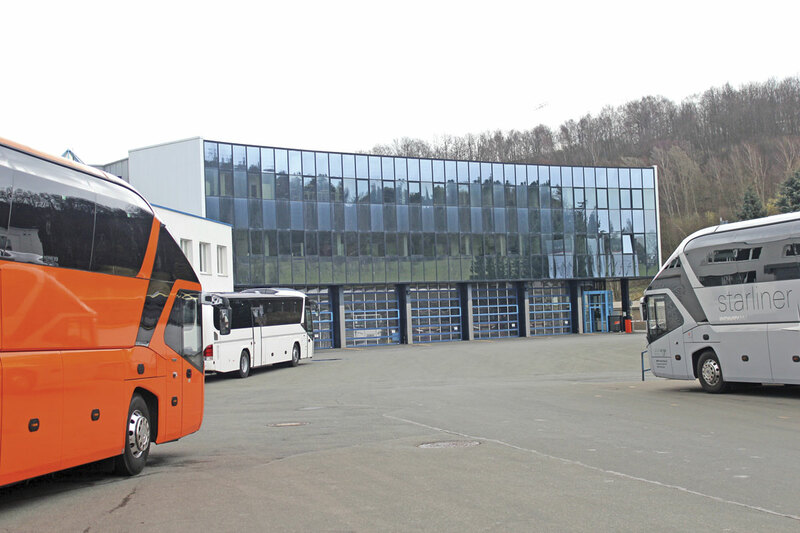 Today it’s a state of the art bus plant with all the modern production techniques and technologies to ensure the best quality you could have. I’m quite confident that it will bring us both a better cost position and also a better quality situation. SJ. Will the fact that none of your coaches will now be built in Germany impact on the appeal of the brand and ultimately on sales? AN. Of course there is always a risk when you make a change that some customers say ‘can we trust this new site where they are to be produced?’ but I am quite sure that we can convince our customers and show them by our performance that our products are performing and the quality is the same as being built in Germany. We have to not just say, we have to prove it, but I estimate that it’s not a big risk because we already do produce buses for Germany in Ankara. The Lion’s Coach is produced in Ankarra already, as is the Tourliner, and the market already knows that we do this, so from that perspective I see that it is a low risk. We do have to take care of it, work with the customers and show them what we are doing in Ankara, and make sure they understand that quality is still the centre of gravity for our brands. We also have a special training programme for our colleagues from Ankarra in Plauen to ensure that the shift of production is working very well. It’s the knowledge transfer that you have to provide. I feel very confident that we will see good results from this. SJ. You have just won the International Bus of the Year with a CNG powered Lion’s Star GL. How great do you believe the scope for gas is in the future of the bus industry? AN. Coming back to sustainability questions, that is one way of keeping down greenhouse gases. We see many countries where they have a lot of gas resources that are really interested in looking to gas solutions. Even though, today, Russia is perhaps not the best example to talk about, with their extensive gas resources they are extremely interested in gas solutions. We see from a number of places around the world that natural gas is technology that people want to bring forward. We are market leader in this technology so I think we will see an increasing part of our business coming from CNG. SJ. What percentage of MAN bus and coach production will be entirely diesel powered by 2020? What about other fuel types? AN. That’s a hard question. Especially in the city bus segment, we see a big move into alternative drives; anything from hybrids to gas to bio-diesel. A lot of cities have their own problems and I think we will see an increasing tendency in this direction towards everything from pure electric drive down to CNG. But for many applications the diesel engine is still absolutely the best solution. As soon as you come into a little bit longer distances, suburban traffic and so on, you start getting into a more difficult situation, even with gas buses, and also bio-diesel when it comes to the supply. With electric, as you know with the battery technology, longer distance electric driving is not possible with the current status, so that will take some more time. But for city buses specifically I am quite sure we will see an increasing tendency in the direction of alternative fuels and alternative forms of drive. If I knew the exact mix it would be fantastic. That would really help us to take the right decisions. At the moment it is anyone’s guess. Will it go in the direction of gas for the next three, four or five years, will hybrid explode, will electric drive come into inner cities? – we have to really work with all of these technologies to make sure that we are prepared for the future, and that we do. We research and develop products in these directions, but exactly which products we bring to market and when, that is the million dollar question. SJ. MAN bus sales have virtually disappeared in the UK and with the only coaches sold carrying the Neoplan brand, the Lion is far from rampant in the market. Is this a position you are comfortable with and if not what measures are you taking to re-engage with the market? AN. We are continuously looking into the UK market, it is an interesting market. On the coach side it is a little bit easier in that, in city buses, you have your local brands and producers that have a good standing in the market and also very UK specific solutions. It makes the UK a bit complicated to get into. It’s not a closed market but a very specific market when it comes to the demands from the cities for double deckers and so on. Dennis has a very good standing in the UK. We will continuously develop our products to meet the requirements of the customers in the best possible way. To be honest, I hope that the UK market will move in the same direction as outside of the UK. If you look into Europe the UK is one of the big markets. Of course we want to have our position in the UK, of course we’re looking into which products can be produced that will really satisfy the demands of the UK customers. I can’t disclose exactly what we’re introducing in the next couple of years but I’m sure that what you will see is that in the city bus segment we will renew our buses and I’m also sure that there will be a good surprise and good events for UK customers. On the coach side, here we will continue working with our integral products. My feeling is that on the coach side we have a better position than we have on the city bus side. For sure, there is always the question of how many products you can bring in with right hand steering, that is always an issue with the UK, but the new generations of products we develop are for both right and left hand steering. SJ. With Euro6, operators are more dependent on manufacturers than ever. How is MAN meeting this need? AN. By making sure that the quality of our products is outstanding. We have seen that the results from the first Euro6 vehicles in the field are really, really good, in their performance on fuel consumption and on the reliability side. It goes both ways, we are really depending on the customer to do their part and they are depending on us. We have to guarantee the product for 700,000km or seven years – that’s quite an undertaking. We do need a close cooperation with our customers, they need to rely on us but we also need that they take their part by maintaining vehicles in the right way. SJ. Do you anticipate any major changes in the customer/manufacturer relationship in the coming years, for instance in financing? AN. In the complete portfolio of business solutions, financing, servicing and repair and maintenance contracts become more and more important. We see from customers that what they demand from us is a predictable, reliable cost for the vehicle. That means that the soft products around the hardware are becoming more and more important. We have to make sure that our support in the markets, the retail side and the service side, are working well. We have to make sure that our staff are well trained for the products in order to take this opportunity. To serve the customer is for us a really good business opportunity. With technology the relationship has to be intensified and that means we have to perform more soft services than before; anything from financing to service care. With telematics we can see the vehicle and say to the operator, ‘we can see you have a problem with your brakes,’ it’s an outstanding possibility to help the customer avoid involuntary stops. SJ. How great a threat is China to the industry and in what timeframe? AN. The Chinese market is a very interesting market. It is extremely big but with the type of vehicles at this moment it is not really an addressable market with our products. The volume segment is still at price levels that do not represent the quality levels you would expect from a European producer. I think that is also reflected in the car side where the premium models are becoming more and more requested. We do see both trucks and buses in China moving into the more premium segments with expectations of a comfortable ride, no surprises in reliability and also, with the situation China has with pollution, they are also moving into what types of sustainable drives are available. With buses they are driving electric development quite hard. I’m sure we’ll see more and more solutions from hybrids to gas, bio-diesel and so on. The Chinese market is a big opportunity for the future. Today, it is really a small market and hard to address with the current demand points. Competition is always good, it keeps you on your toes, but having some personal insights from Chinese companies, what you see is if they want to provide the same quality that we have, the cost for their products is not very different. 75-80% of a vehicle is bought components. These bought components are things like the steering gear and other important items for quality. The Chinese are looking into it and buying the same type of components to create the same reliability. They will end up with a higher cost for the bought material. If I take a truck as an example, only 10-15% is personnel costs, the rest is other costs and if you use the same material and the same machinery to build the vehicles, at the end of the day the difference in cost will not be that big. I have a huge respect for the Chinese manufacturers and they will develop their products, but if you have to provide the same kind of products, the efficiency in how you do it will be the decisive part. I’m quite sure we will be competitive with the Chinese. They will bring competition to Europe and around the world in time. There will be applications where a lower quality is looked for and they can play a role today, where it doesn’t make any sense to buy a European truck. If you have very short mileages a year you perhaps don’t need it, but the more mature customers that have total cost of ownership in mind who use the vehicle for up to 150,000km a year, they need a reliable product. SJ. You have avoided North America for many years after earlier negative experiences. Do you see any reason to reappraise that view? AN. Long term, North America is an interesting market but it’s not our focus at the moment with our current product portfolio. We have a lot of more close by markets where we can achieve much better results in the short term. Long term is a different issue but you need a different product portfolio to satisfy the American customers. Then it’s a question of when do you see the volumes, when do you see the possibility to step in, but it’s not a focus for us at this moment. SJ. 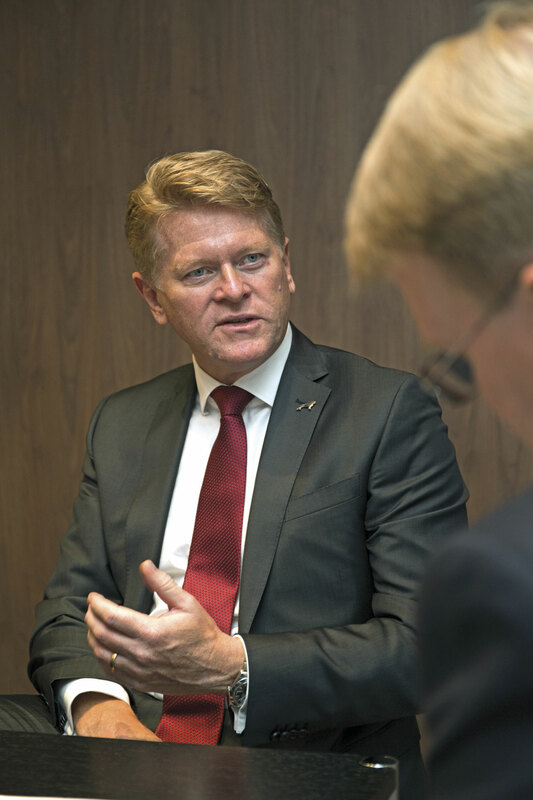 What do you see as the biggest Challenge facing the European bus manufacturing industry? AN. I think the biggest challenge for the whole business is the low profitability of the business. If you take the city bus segment, you have the cities they are complaining that public transport is too expensive, the operators have no margins and the bus producers are not making a hell of a lot of money. Somehow we will have to find a way to make it good for the customers, with a really good service, it has to make sense for the operator and it has to make sense for us. To find a business model that really satisfies the stakeholders in the bus business, that is the toughest issue. As you know, at the moment there isn’t a lot of profit flying around in the truck and bus business, not for the operators, not for the producers and not for the buyers. I think the most satisfied is probably the family travelling on the long distance lines in Germany where there have been extremely nice prices to buy coach tickets to go from one part of Germany to another one. It’s very successful but on the other hand the price pressure is really there. To make a really good business, it has to make sense to all stakeholders. That’s my biggest challenge and the biggest challenge I see for the bus business. SJ. Anders Nielsen, thank you very much.